Reserve Grand Champion Suffolk Ewe! also 2nd at 2016 Ohio State Fair. at 2015 Indiana State Fair. 2016 Ohio State Fair 1st Place Best 4 Head - All Slick Shorn! at the 2014 Ohio State Fair. National Suffolk Show, Louisville, KY.
"328 Isil" wins 2014 Ohio Suffolk Yearling Ewe Futurity. "Gietta" #286 wins the 2013 Ohio Suffolk Yearling Ewe Futurity. Wiford #328 - Daughter of #829 - Won Slick Shorn Ewe Lamb Class at 2013 Ohio State Fair. He is full brother to "Gietta". Congratulations to Mike & Becky O'Neill on having Reserve Junior Champion Slicked Ram on Wiford 341 at the National Suffolk Show in Louisville. He is a son of Wiford 772 and Slack 0246. Congratulations to Wyatt Shepherd on his Grand Champion Breeding Ewe at the 2013 State Fair of Louisiana. The ewe was a ewe lamb purchased from us. Daughter of 821 and Slack 0246. What a Fantastic Year at Louisville and Columbus! What a Day In Louisville! Reserve Junior Champion Ewe! 286 "Grietta" 2nd Place Early Slick Shorn Ewe Lamb - 2012 National Show. Member of 2nd Pair of Slick Shorn Ewe Lambs. "Most Talked about Ewe Lamb in the Barn! 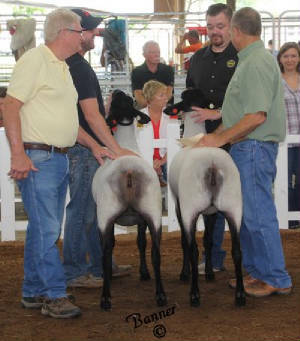 1st Place in 2012 Ohio Suffolk Yearling Ewe Futurity at Ohio State Fair! Thanks Jim Brandt and Neal Knapp for showing this ewe. 2012 - 2nd Place Pair of Slick Shorn Ewe Lambs in Louisville - 283 "Ilana" & 286 "Grietta"! "Ilana" was 5th Place Early Slick Shorn Ewe Lamb! Thanks Jim & Steve for helping show. 2nd Place Ohio Suffolk Yearling Ewe Futurity at Ohio State Fair! Thanks Pat and Steve Myers for showing this ewe. 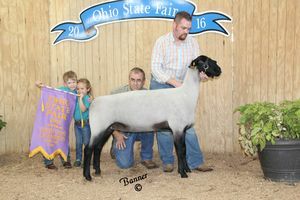 286 "Grietta" 1st Place Slick Shorn Ewe Lamb 2012 Ohio State Fair. Our other Ewe lamb - 283 "Ilana" was 2nd to this lamb! 299 "Abigail" 4th Place Late Slick Shorn Ewe Lamb 2012 Louisville National Show! 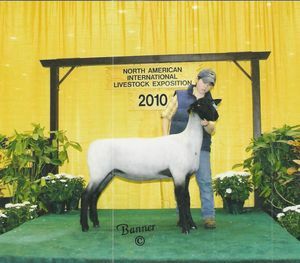 1st Place Early Slick Shorn Ewe Lamb at 2010 NAILE! Also 1st Place Pair of Slick Shorn Ewe Lambs!! 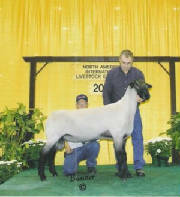 "Gévauna" was Champion Ewe in the 2011 Ohio Suffolk Yearling Ewe Futurity! 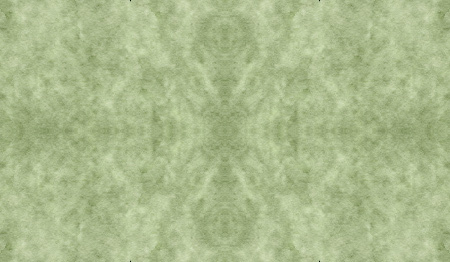 Quality Like This For Sale! but perform in the barn". Thanks to all our 2017 Buyers! and good luck with your purchases. Tom Slack L9154 Stud Ram. 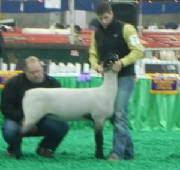 Sire of our 2011 Lambs - Reserve Senior Champion at NAILE. He sired a tremedous set of lambs for us. 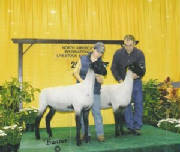 "Gévauna" and "Zane" - 1st Place Pair of Slick Shorn Ewe Lambs at 2010 NAILE! 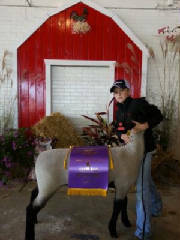 "Zane was 1st place slick shorn yearling ewe at 2011 Ohio State Fair!